Handmade white pearl 144mm sq. 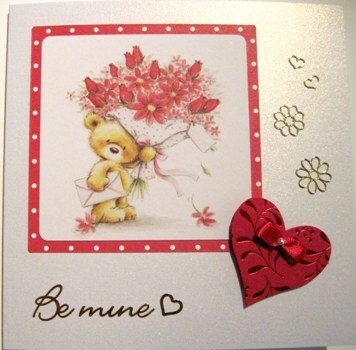 card with picture of bear holding a bunch of red flowers, matted onto red and white dotted card. 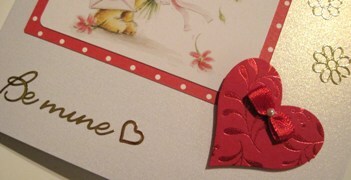 The words 'Be Mine' in gold, outline flowers and hearts, and a raised red foiled heart finished with a little red bow. This card is blank inside, but can include a printed paper insert if you prefer. Please use the Personalise form.